1. Size and Cover: The size of the SBP edition is substantially the same as the Fireside Companion Edition. The photos compare it to Ignatius' RSV-2CE leather edition. I think the SBP cover is a little nicer than Fireside's Companion Edition, but the cover on the NCAB is as nice as the SBP, which is strange because Fireside says that their Companion Edition has the same cover as the NCAB. 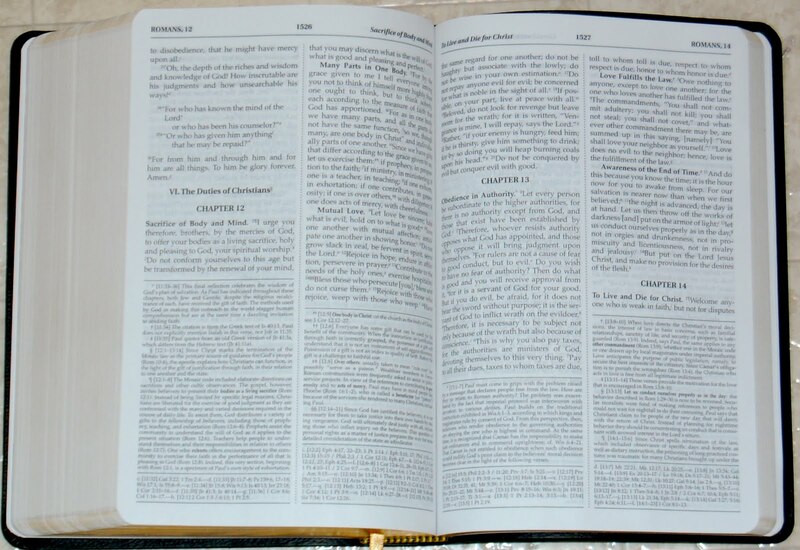 However, the NCAB is a slightly larger bible and more expensive. 2. Typeface and layout: Jonny did a great job explaining the difference between Fireside's Companion Edition and SBP's edition. So which is better? I think that depends on intended use. Fireside's cross references are much easier to use and locating verses is easier as well because the verse numbers are in bold print. So, if you plan on using these features, go with Fireside. In fact, if the larger size of the NCAB is not an issue, then I would recommend that edition because the font size is larger (but it's not a large print bible), making it easier to read, and I think it is a nicer edition overall than the Companion Edition. However, if you have another edition of the NABRE that you use for study like the Little Rock Catholic Study Bible (which I do and like very much), and want another edition of the NABRE that is more portable and is more inviting for prayerful reading of the bible (such as daily readings), I would recommend the SBP edition because the notes (which are at the bottom of the page beneath each column as opposed to only the right column on Fireside's edition) and verse numbers are less distracting than Fireside's edition (in my opinion). 3.Other details: It has one gold ribbon marker (as an aside, I wish publishers would make 2 or 3 ribbons the standard). The front of the SBP edition has a presentation page and Family Registry pages (births, marriages, d eaths), the Succession of Popes, and a list of the collaborators for all the various editions of the NAB from 1970 to the present. 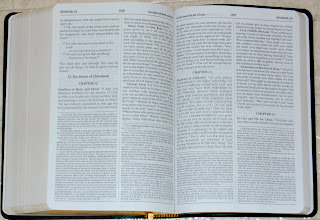 The back of the bible has a calendar of readings for both weekday and Sundays throughout the year and several sections of prayers separated by the following categories: Favorite Catholic Prayers, Prayers to Jesus, Prayers to Mary, Prayers to and with the Saints, and at the end four simple color maps (Palestine in the Time of Jesus, and one for each of Paul's Journeys). Finally, SPB's edition has the words of Christ in Red, which I know is non-starter for many people. The photo, although not the best in clarity, gives you a good sense of what it looks like. I don't think it's as bright red as I've seen in other bibles and it doesn't bother me. Even if you're normally turned-off by red letter editions, I think the SBP edition should still be considered. So, go to a Catholic bookstore, spend some time with the various editions, and get the one (or more than one!) that will suit your various needs. Remember, the best bible is the one you read! With all these great editions coming out from SBP, I wonder if they've thought about publishing parallel Bibles. I would especially love it if they could get the rights to print the Jerusalem Bible, and print a Douay/RSV/JB/NABRE in leather (and throw in the Revised Grail Psalter for good measure).